The French national anthem is known as La Marseillaise, translated in English as The Song of Marseille. It is often heard on Bastille Day and this French traditional song commemorates the French Revolution of 1789. La Marseillaise was written on April 4, 1792 by Claude Joseph Rouget de Lisle in Strasbourg. It was originally titled, Chant de Guerre pour L'Armée du Rhin or The War Song for the Army of the Rhine. The song was written as a response to the invasion of France by Prussian and Austrian forces who were later defeated at the Battle of Valmy. A young doctor from Montpelier, François Mireur, had sung it in Marseille at a patriotic banquet. Printed copies were handed out and the song spread through the city. When French revolutionaries from Marseilles entered Paris, they marched to the Tuilleries singing the song. From then on it was known as La Marseillaise. Rouget de Lisle was in fact a loyalist supporter of the monarchy who barely escaped the guillotine. Mireur went on to fight in Napolean's army and died at the age of 28. 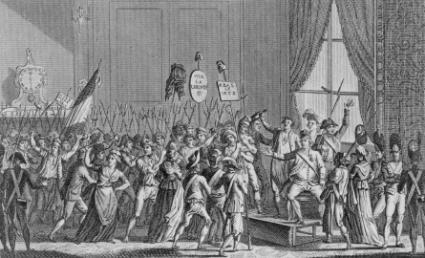 The instability that followed the French Revolution of 1789 affected the national anthem. La Marseillaise was initially adopted by the National Convention on July 14,1795. However, when Napolean I came to power in 1799, the song was banned because of it's revolutionary associations. After the abdication of Napolean, the Royalists installed Louis XVIII who ruled during the Second Restoration. La Marseillaise remained banned until the July Revolution of 1830. La Marseillaise was last banned when Louis-Napoléon Bonaparte became Emperor of the Second French Empire in 1852. It was finally reinstated in 1879, and has been the official French National Anthem ever since. Aux armes citoyens! To arms, citizens! During the reign of Napolean I Veillons au Salut de L'Empire was the unofficial anthem. It was originally composed by D'Aleyrac in 1791. Partons pour la Syrie is a French military song about Napolean I's campaign in Egypt. It became popular among bonapartistes during the first restoration of the monarchy and then became the official anthem known as Choral du Peuple until the end of the Second Empire. La Marseillaise is a rousing anthem that celebrates France's proud history of resisting tyranny and fighting for freedom.